← What’s Really Behind the Washington Post’s Efforts to Marginalize Bernie Sanders? At 10 a.m. this morning, Federal Reserve Chair Janet Yellen will take her seat before the U.S. Senate Banking Committee to deliver her semi-annual testimony on monetary policy. She’ll perform the same task tomorrow before what is likely to be a far more hostile House Financial Services Committee, based on the fireworks that were flying in her last testimony there in February. There will be a shadow wafting over Yellen at both hearings. The shadow is being cast by Neel Kashkari, who took the reins as President of the Federal Reserve Bank of Minneapolis this past January and has effectively transferred the debate on too-big-to-fail banks from the hands of Yellen to his own regional institution. Kashkari has been conducting symposiums and delivering speeches on the issue and has promised a formalized plan to deal with the problem by the end of this year. “Do we really believe that in the middle of economic distress when the public is looking for safety that the government will start imposing losses on debt holders, potentially increasing fear and panic among investors? Policymakers didn’t do that in 2008. There is no evidence that their response in a future crisis will be any different…. “Citigroup’s five-day death spiral last week was surreal. I know 20-something newlyweds who have better financial backup plans than this global banking giant. On Monday came the Town Hall meeting with employees to announce the sacking of 52,000 workers. (Aren’t Town Hall meetings supposed to instill confidence?) On Tuesday came the announcement of Citigroup losing 53 percent of an internal hedge fund’s money in a month and bringing $17 billion of assets that had been hiding out in the Cayman Islands back onto its balance sheet. Wednesday brought the cheery news that a law firm was alleging that Citigroup peddled something called the MAT Five Fund as ‘safe’ and ‘secure’ only to watch it lose 80 percent of its value. On Thursday, Saudi Prince Walid bin Talal, from that visionary country that won’t let women drive cars [Saudi Arabia], stepped forward to reassure us that Citigroup is ‘undervalued’ and he was buying more shares. Not having any Princes of our own, we tend to associate them with fairytales. The next day the stock dropped another 20 percent with 1.02 billion shares changing hands. It closed at $3.77. Here’s what it took eventually from taxpayer to shore up this serially mismanaged mega bank: $45 billion in equity infusions, over $300 billion in asset guarantees, and more than $2 trillion in secret, cumulative revolving loans from the Federal Reserve at below market interest rates. By one Reuters analysis, Citigroup had an astronomical 280x leverage ratio at the peak of the crisis in 2008, $2 trillion in assets on its books, and $1.2 trillion off its books, despite the fact that it was overseen by five Federal regulators at the time. 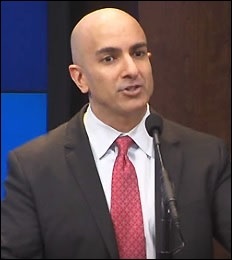 The one concern about Kashkari is that in an earlier incarnation he worked at Goldman Sachs, which transformed itself into a bank holding company during the 2008 crash in order to get its share of taxpayer bailouts and cheap loans from the Fed. Goldman Sachs is predominantly an investment bank and has only a small presence in commercial banking. Kashkari has also floated the idea of capping a bank’s asset size. That would tend to help Goldman Sachs compete better against the much larger Wall Street banks that own massive commercial banks as well as investment banks and retail brokerage firms. What Kashkari isn’t pounding the table for is the restoration of the Glass-Steagall Act which would entirely separate the commercial banks holding taxpayer-backstopped insured deposits from the high-risk-taking investment banks and brokerage firms. Until Kashkari opens that debate for a full airing, it would be wise to remain skeptical about his agenda.